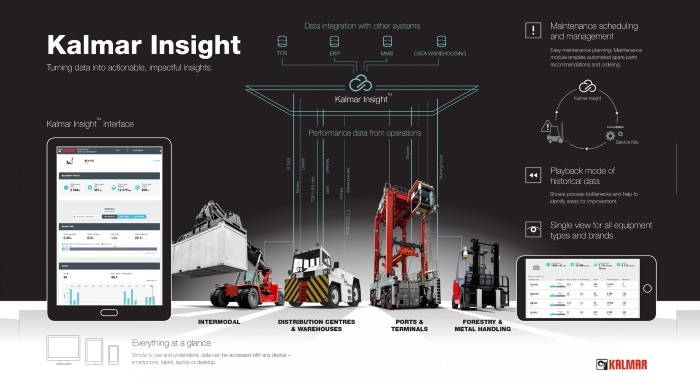 “We have massive amounts of data, but the challenge is how to utilize it and turn potential into action,” says Janne Vento, Product Manager, Kalmar Insight. This is what Kalmar’s new Insight is all about. It is a solution that helps customers optimise their performance based on data collected from cargo handling equipment and operations. “Insight collects together data from your entire fleet and puts it onto a single platform, including equipment built by other manufacturers. For the first time, operators have a real-time, holistic view of their site and equipment performance,” explains Vento. “Our customers face several headaches in their everyday operations. Fleet availability is one of the biggest,” says Vento. “Kalmar Insight can help to solve these headaches and much more. It gives customers new functionalities and benefits that other fleet management tools can’t offer,” states Vento. At one glance, Insight provides real-time, historical information on multiple and individual sites, whole fleet and single machines, as well as shifts or on individual drivers. Companies can check parameters, such as running hours, moves, energy consumption, overload events and errors. Users can compare, for instance, each machine’s operating hours or the performance levels between different terminals. It makes it easy to spot, for example, when one machine uses more fuel than others. Insight also has a playback mode where customers can view historical data that can show process bottlenecks and help identify areas for improvement. All of this combined, simplified information allows customers to make decisions and take action that will have an immediate, positive impact on their business. Vento says that Insight can also be used to provide a strong incentive for drivers to improve their driving skills. Information on each driver's performance can be shared amongst the team as a sort of workshop to improve everyone's performance. “All in all, Insight helps to make strategic decisions that improve operational productivity and profitability, maximise fleet availability and increase safety. And even more important, it helps you to stay informed so you can enjoy peace of mind,” says Vento.